I've had lots of folks ask me to make a super fluffy butter cream, and since I'm not a huge fan of putting in vegetable shortening, I usually make mine with 100% butter. Normally I use un-salted butter so I can control the amount of salt going into my baking, but as I thought about it.. there is soooooo much sugar in icing/frosting, the amount of salt in salted butter is negligible, and salted butter is waaay easier on the wallet (I always use Lactancia cultured butter as it has better flavor so not that much less pricey lol) and so since I was test baking cakes for an upcoming girlfriend's baby shower, what better way than to test some versions of buttercream while I'm at it? And since I didn't have pictures of how to properly crumb coat and cover a cake in buttercream when I made a LEGO minifigure head cake last time, I took pictures along the way! I'll post the recipe for the white/chocolate cake in a later post as this one will be long cuz I'll be pretty detailed! 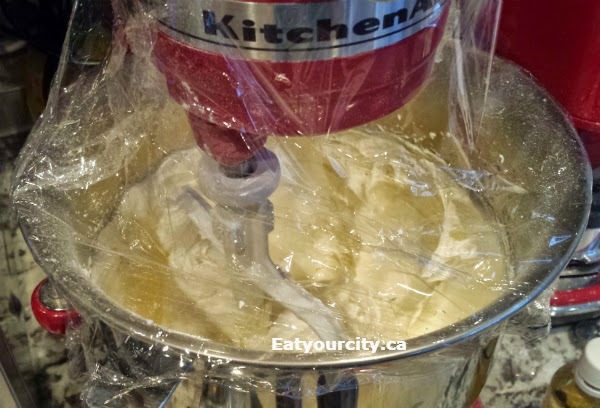 So here's some tips on how to get your white buttercream fluffy and white! 1) If you are trying for a super fluffy gleaming, impress your dentist white buttercream, hunt down and invest in a clear vanilla extract. Yes, its an artificial extract as true vanilla has color. Be careful of vanilla extracts from Mexico as sometimes it contains Coumarin- a toxic plant material that tastes and smells like vanilla. I use Wilton's clear Madagascar vanilla extract if I realllly need super white frosting. 2) If you are a stickler for everything au natural, use the best pure Madagascar vanilla extract you can find (vanilla pods are ok, but you'll get a bunch of pepper-like specks in your buttercream). Neilsen-Massey is really good, and Wilton's pure vanilla extract packs a good punch of flavor too. 3) Sugar free vanilla extract is a marketing gimmick... we put vanilla into sweets, desserts, cakes, frosting and icing... in other words, vanilla is added to sugar! So buying sugar free vanilla seems a bit of a waste of money unless you're trying to make completely sugar free desserts. 4) Whip it good. Whether you're using vegetable shortening (increases stability of frosting/icings at room temp), or all out 100% butter (me! ), use the regular beater attachment rather than the whipping whisk attachment (the stuff you're trying to whip is thick and heavy, so the whisk attachment won't cut it). Gently beat in sugar additions until its well mixed in... then crank it on high for a minute or two. 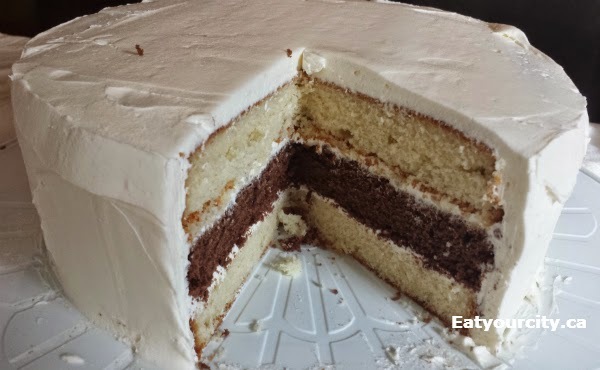 The more air you can put into it, the lighter, and whiter your buttercream will be. To prove the point, I made this buttercream with regular dark brown pure Madagascar vanilla extract. Yup, dark as sin, and the pics of the buttercream (unphotoshopped) show the color of it - using pure 100% butter does give it a slight yellow to the butter cream.. until you whip it and whip it good! Hahahaha!).. The pic below is the yellowy color it is initially, scroll down to see how much it lightens up. 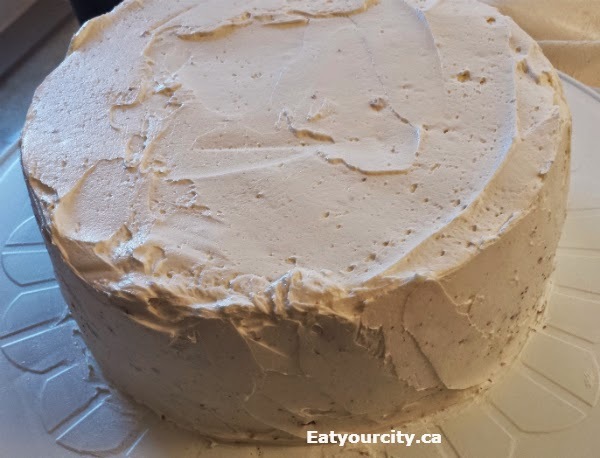 How to crumbcoat and cover a 3 tiered cake in buttercream! 1) Cut the tops off of your cakes - I use the small Wilton cake wire leveler as I found it handles cakes up to 10inches without any issue, and since I haven't (luckily) had to make anything bigger yet, I haven't had to buy their bigger foldable cake leveler. This makes sure your cake layers are more or less the same height, and level enough they won't slant and slip off as you stack them up. One of 3 cake layers trimmed of its top! 2) Blob on about a cup of buttercream, and using a waving motion and a medium-large offset spatula (I bought a set of small, med and large off set spatulas so I had choice especially when I got them all crumby), spread it from centre to the edge (push butter cream off edge, rotating the cake as needed. 3) Repeat with the second layer of cake.. note to self... transfer with a cake lifter I didn't bother digging out for test cake next time as the middle layer of cake broke into 2 pieces when I attempted to lift and dump it on top of the first cake layer... its frowning at me lol! 4) For the last layer of cake, flip it so the bottom of the cake faces up - this reduces the amount of crumbs in your crumb layer. 5) Even out the sides by placing your large spatula vertical and spinning the cake in clock/counterclockwise fashion.. pick one direction and stick with it. Your cake doesn't have to be perfectly even at this point, and its probably covered in bits of crumbs everywhere! Mind looked like gingerbread buttercream hahahaha... and it's ok.. that's why its called a crumb layer! Shove it into the fridge for at least 10min for the crumb layer to harden up. Super white buttercream! Pic taken in an afternoon sunbeam, no photoshop. 2) Beat at medium speed until light and fluffy. You can add in up to 4 tablespoons water total to thin out the icing to the consistency you prefer. I like beating it for at least a minute on high after each addition of sugar... and am known to walk off and let it beat on high for about 5 minutes to let it get really light and fluffy at the very end.. you can't overbeat buttercream.. it only gets fluffier and lighter.